If you are bored with your old IKEA - HAGALUND sofa, you are just in the proper place to give this piece of furniture a new life and change it in a way into something new, covered with a different material in a different, beautiful colour. 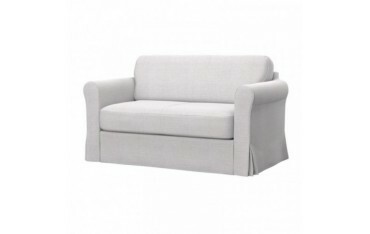 The offered replacement slipcover for the IKEA - HAGALUND sofa will cover this particular piece of furniture totally. So, it is not only for the seats and the backing part, but also the base, down part of the sofa. Furthermore, most of Soferia replacement slipcovers for your old and a little bit clumsy and probably quite boring as well IKEA - HAGALUND sofa are hydrophobic - it means, that they do not absorb water. From this moment on, any time you pour anything you are currently drinking on your sofa, you do not have to worry, since it is very easy in tidying and keeping it clean! If such an accident happens, simply wipe the liquid iwth a cloth. If you feel like it you may also take the slipcover off and wash it in a washing machine. The replacement slipcovers for IKEA sofas combine ease of cleaning and comfort of usage at once.